Narcissistic abuse - What is it and how do you handle it? We’ve written a lot about narcissistic control and abusive relationships in the past (click here and here). Why do we keep revisiting this topic? Because as divorce attorneys we see a disproportionate number of narcissistic personality disorder cases. Unsurprisingly, for the partners of individuals who suffer from these conditions, life can become unbearable and the breakdown of a relationship often ensues. As family law specialists we try hard to help survivors of abusive control navigate the dissolution of the relationship and the next phase of life, which may entail a continuing relationship with the narcissist as a co-parent. Technically there is a difference between narcissistic personality disorder (NPD), which is considered a psychiatric disorder, and narcissism, which is a social trait, but the boundaries are often blurred and the terms used inaccurately. Someone who displays narcissistic traits may be vain and irritating, but is probably unlikely to become abusive or controlling. NPD, on the other hand, is characterised by abnormal behaviour that includes exaggerated feelings of self-importance, excessive need for admiration, and a lack of empathy for others. The bible of the American psychiatry profession, the Diagnostic and Statistical Manual of Mental Disorders (DSM), categorises NPD as a “Cluster B” – dramatic – disorder, typified by a fixation on feelings of power and a grandiose sense of entitlement and superiority. True NPD inhibits someone from forming meaningful human relationships; but, paradoxically, they may be charming and attractive, and vulnerable people in particular may be drawn to them. “You’re jealous” (or “manipulative”, “crazy”, “insane”, etc.). We all say these things in jest occasionally, but if it is said with malice or disdain, and it makes you feel bad, it may be indicative of NPD. “You’re overreacting” (or “insecure”, “oversensitive”, etc.). Chances are your reactions are perfectly legitimate, but these adjectives will sow seeds of self-doubt and help to make you vulnerable, which is just the way the narcissist wants you. “You misunderstood me.” Maybe you did. From time to time we misunderstand our partners. But if you hear a barrage of “you did this, you did that” with no acknowledgement of the other’s role in the transaction, you are being manipulated into feeling guilty or flawed. “You’ll never find someone like me.” This has two interpretations, both dangerous: it reflects a warped sense of worth, indicating feelings of superiority; and it implies that you are lucky to have them and aren’t likely to be successful in finding anyone else stupid enough to love you (an undermining tactic). Run away. With luck, you won’t find someone like them again! It’s tempting to say, “don’t deal with them”. Move on. But the reality is…you may have to deal with them. Or you may want to. The narcissist may be a family member or a work colleague whom you can’t escape. Or they may be your partner, and whatever their faults, you do love them. It’s important to remember that a disorder is just that. It is not deliberate behaviour and usually not personal – even though it feels excruciatingly so. The narcissist is too absorbed in their own thoughts to intentionally try to hurt you; the pain you feel is collateral damage. And there are ways to mitigate that. Refuse to play their mind games. This is easier said than done, because it is easy to get “sucked in” and not recognise the games for what they are. Don’t be defensive when being blamed for something; simply present the evidence to the contrary. Don’t respond to digs, and don’t doubt yourself if you remember a situation differently from how the narcissist describes it. Your memory is probably just fine but narcissists are very good at manipulating you. Don’t fall for it. Don’t expect to be listened to. 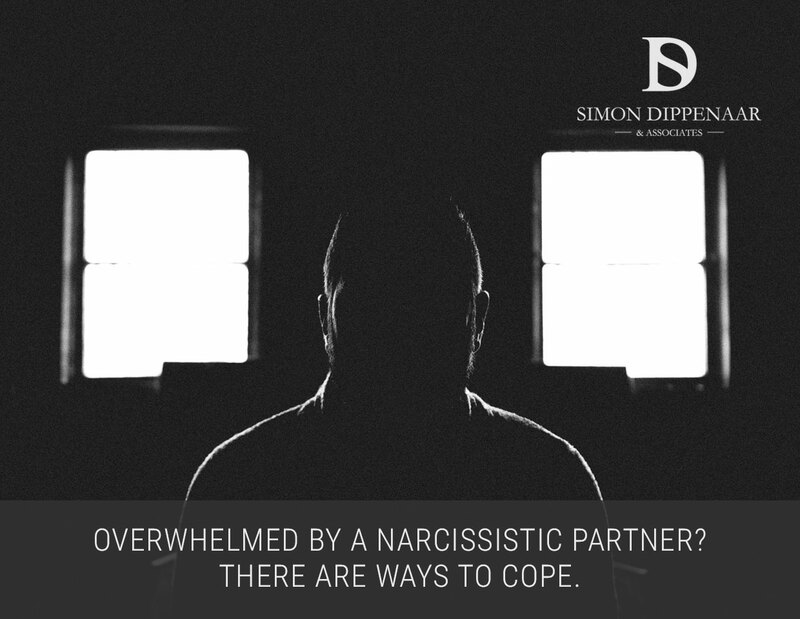 As much as you should be able to offload on someone close to you, a narcissist just isn’t capable of empathy. They will not be able to give you the support you need; you’ll have to look for it elsewhere. Find ways to bolster your own self-worth. It will be constantly undermined by the narcissist, and it’s important not to start to believe their version of you. If you have intrinsic faith in yourself, you will be more able to withstand the fault-finding you may endure. Set boundaries. A narcissist may find it difficult to see things from your point of view, but they will understand boundaries if you consistently and calmly communicate them. Know what you can and cannot tolerate and stand your ground. Eventually the other person will learn to respect your boundaries. Finally, try to understand them. It’s not easy, but if you can remind yourself that the charges they lay at your feet are really aimed at themselves, and that they do genuinely have a disorder, you will be more able to respond with compassion rather than anger. If things get too bad, it is possible to stage an intervention, but this must be carefully planned and involve the support of a trained professional. If life with a narcissist spouse becomes unbearable, you may decide to consider divorce. Divorce isn’t easy, whatever the circumstances, but an “amicable divorce” is almost impossible with a narcissist. There are particular pitfalls to avoid if you want to emerge from the process as unscathed as possible. This will be the subject of our next blog post. SD Law & Associates are experts in divorce and family law and have dealt with many cases of narcissistic control in intimate relationships. If you are married to someone with NPD and considering divorce, or just want to discuss your options, we can guide you through the process with compassion and dignity. Contact us on 087 550 2740 or 076 116 0623. Or contact us. This entry was posted in Divorce and tagged narci narcissism, narcissist, narcissistic abuse. Bookmark the permalink.